Live entertainment, crafts, food, children’s activities, Junior Sunshine Christmas parade and a visit by Santa will all be part of the 32nd annual Light Up Ocala event on Saturday, Nov. 21. 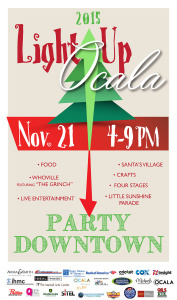 The festivities will take place from 4 to 9 p.m. in beautiful, historic downtown Ocala. Stages for the event will be located on the corner of Fort King Street and South Magnolia Avenue, North Magnolia Avenue, the Downtown Square and Citizens’ Circle. In order to accommodate pedestrian traffic between the north and south venues, SR 40/Silver Springs Blvd. will be closed adjacent to the square. The highlight of the event will be the lighting of downtown Ocala including a 42-foot Christmas tree which is scheduled for 6:30 p.m. Acts providing musical entertainment will be announced soon and a wide array of dancers and musicians will be performing throughout the evening. The Downtown Holiday Skating Rink, “Let’s Skate Ocala” will be open at the event. We have nearly doubled the size of the rink last year, which will allow more space for you, your family and friends! There will be Kids Events games and Fun Zones throughout the evening. For more information on this Saturday’s Light Up Ocala Event, visit http://www.ocalafl.org/lightup/.